The Capital CDC team topped the charts with 24 SBA 504 Loan Approvals totaling $26.6 million for Fiscal Year 2015 (Oct. 1, 2014 - September 30, 2015). Capital CDC was recognized at the NTAGGL (National Association of Government Guaranteed Lenders) Quarterly Luncheon on January 21, 2016 in Dallas. 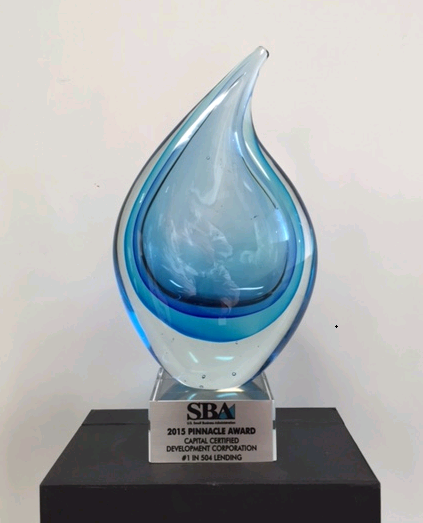 The DFW District Office presented Capital CDC with the 2015 Pinnacle Award (pictured). Thanks to all of our lending partners for working closely with us to provide 504 loans to deserving small businesses! We love being able to help create jobs and help business owners purchase commercial real estate and equipment to grow their business! Please contact a Capital CDC Loan Officer for questions regarding SBA 504 lending with Capital CDC in the Dallas/Fort Worth area. Their contact info can be found here.